1) Replacing my Brooks saddle for a Specialized road bike version with titanium rails and some 330g lighter. (This has been a great success so far. The weight saving is really noticeable and it is as comfortable as the Brooks). 2) Brompton stock hinge clamps have been replaced with a titanium version from Brompfication. These are only marginally lighter but they do offer a much speedier fold/unfold. 3) Front carrier block has been removed and will not go back on again. 4) Marathons have been replaced with Kojaks. The Kojaks offer a huge weight saving an although I may not keep them on during a British winter (although my friend Mark (King of the Hill did and lived to tell the tale) I might consider it. 5) Mudguard have been taken off although during the winter months they will almost certainly go back on. 6) I finally replaced the stock foam grips for an Ergon lightweight version that instantly proved a great deal more comfortable. I commute to work every day on my Brompton all year round. The only weather conditions that prevent me from cycling to work would be snow, ice or a heavy fog. The only other factor that stops me from using the Brompton is if I have to carry a particularly heavy or large load that would be impossible on a Brompton. 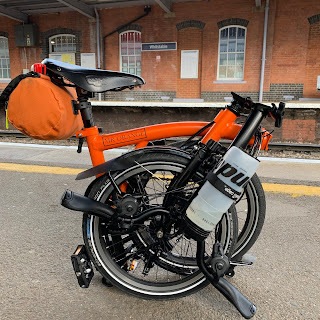 My plan is to use my Original Orange Brompton for my daily commute and use my Titanium Orange Brompton for recreational use which represents all my Brompton club rides, weekend adventures and of course racing. (If the weather is terrible I have the option of using my Original Orange Brompton). This has been a decision that has almost made itself and my Titanium Orange Brompton seems to have fallen into this pattern of use quite naturally. To my mind I will look forward to using my Titanium Orange Brompton even more. I suppose is is the luxury of having more than one Brompton - one for work and one for play. Saying this commuting to and from work on a Brompton is a gleeful experience compared to other forms of transport. As these new roles for my Brompton bicycles takes shape I will further focus my attention on making my Titanium Orange Brompton the best bicycle I can for longer rides, racing, ascending hills and general adventures. This journey will take me some time but I will share each new development as and when they are place. I have been following your blog on a regular basis and I love it. I am from India and have ordered a bromton (H2L - 2013) and It should be delivered shortly. Congratulations on the high number of blog page views, and out of those 28k, my count would be 1k as I visit your blog more than once a day just to look at the Brompton. 10kms one way on my surly and would continue to do so on my Brompton probably. Hello Mahesh. Many thanks for reading my ramblings. Great to read you've got a Brompton on the way. You're going to love it. Let me know how you get on. You have not mentioned the pedals this time. Have you decided to return to the Brompton pedals or are you staying clipless? Staying clipped in. Much better! I have always thought that if I was going to get another Brompton it would be a more "racing lightweight" type of B compared to Original Bumble B, probably a M6-X yellow ofcourse. But I don't know when that ever would be at the moment, no rush as OBBB is doing me just fine as he is.